I AM two weeks into a mission of light service, opening 5D gateways from Mt. Shasta to Sedona (and probably more). The push to leave Shasta and just go was insistent and direct. After lightening my car’s contents to just the essentials, I left Shasta at dusk and awoke to my mission the next morning in Lake Tahoe. I had cleared and charged Bags of lemurian quartz crystal points in the flowing waters of Stewart Mineral Springs, and began to follow guidance on creating a crystalline gateway corridor from Shasta to Sedona. The corridor would begin along the Shasta Trinity mountains and waters, follow the Sierra Nevadas, then link to the Mohave Desert, Joshua Tree, Lake Havasu, the Grand Canyon, Sedona and beyond. The higher intent is to open 5D gateways, or portals, which open up Gaia to the interdimensional portals and photonic light delivering the much-needed 5D accelerations. These gateways/portals/vortexes pull in the higher frequencies, send them through the crystalline core of Gaia, penetrate every particle of the kingdoms, elementals and HUmanity, and create permanent alignments for benevolent 5D frequencies to amplify and accelerate the Shift to Unity Consciousness. Unconditional love flows through these gateways, influencing the highest intentions of service to Gaia and the Ascension of HUmanity. It shortens the linear time frame for change. It speeds up the Ascension process by raising the level of 5D light and stabilizing the new level of higher frequency. A lot of folks ask if they are a Gatekeeper. With honor I reply, What gatekeeper work are you doing right now? That’s not judgment, it’s practicality. I had a huge experience that showed me this aspect of my work (check the posts from last October). Some folks are meant to just hold light, knowingly or unknowingly, during the Shift. Gatekeeping in my experience has been a conscious choice, much like Ascension itself. When presented with an opportunity for expansion, you choose to either take it, delay it, or say no thank you. Please note that in my work I differentiate the subtle choices between Ascension and Evolution. A conscious Ascension process is the desire and active pursuit of expanding one’s consciousness in order to experience all that one is. To REmember the truth, to dispel the illusion, transcend it completely, and fully become the true Self free from any confinement, control or manipulation. Evolution is the inevitable – conscious or unconscious – experience of external factors influencing and changing your lifestream. It doesn’t matter if a person has an awakening; evolution does what it has to because grander collective shifts are occurring. Creative Evolution, the title of this website, is the experience of a conscious evolution transforming us into a fully self-realized Source-in-carnate. We achieve that state of expanded consciousness through the Ascension process: the raising of personal and planetary frequency in order to experience all that we are, pure creation, and higher states of consciousness. Gatekeepers tend to be aware of their Multidimensional Self. The job description for this work demands the ability to integrate new information, new experiences and beyond-the-veil intel quickly – and without much resistance or drama. The things you see, hear, feel take a strong intuitive skill set and trust, trust, trust in your Higher Levels. In the absence of doubt, we are all Source. You’ll need to embody this to the core when missions of opening gateways present. And they do present to Gatekeepers: let me reiterate there is a difference between steadily holding light (thank you) and co-creating stargate/portal openings with the Higher Realms. I received a nice confirmation while opening the 5D Gateways at the Grand Canyon yesterday. Just as an example of the (many) mysterious, miraculous, beautiful experiences on this journey of light. 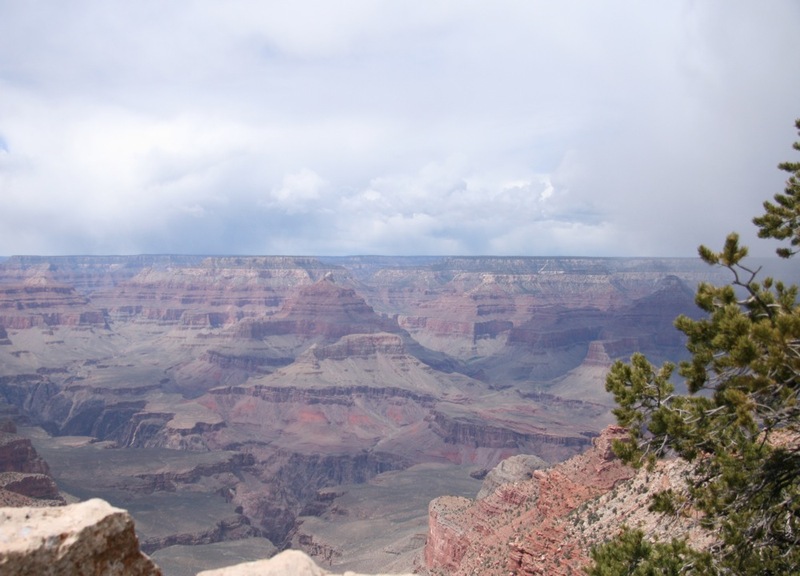 Below is a photo taken from where I settled in the do the 5D Gateway opening on the South Rim. It was cold, gloomy, windy. As I tapped into Gaia and connected to the Higher interdimensional portals, Solaris (the Sun), and Galactic Center, the message came to open the whole Canyon as a 5D vortex – a powerful amplifier of 5D energetics. I began the work. After 30 minutes or so, the Sun broke through and the wind suddenly became eerily still. This lasted for several minutes. 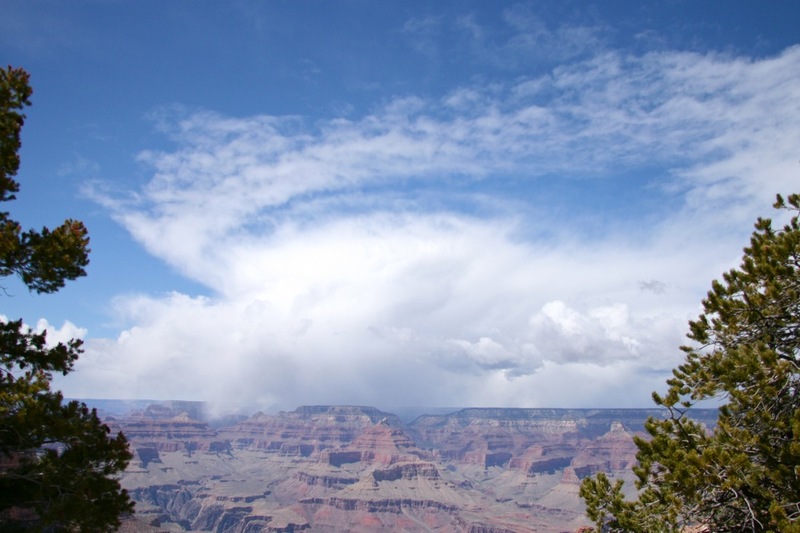 I continued my invocation and focus, and glanced up at the clouds over the Canyon. A huge spiral – in counterclockwise formation, which is what I use to open gateways – had appeared over the Canyon. It stayed there, reflecting back at me the huge energy shift and opening I felt. I tend to be very calm when connecting with higher realms, however this magnificent sight had me working and taking a few photos at the same time. It truly was beautiful to behold. The clouds dispersed after an hour or so, but the 5D energy influx remained steady. I AM in deep gratitude to the elementals and galactic co-creators for showing me this nod of appreciation, confirmation, and very physical manifestation of this gateway activation. The merge of Higher Self and lower Self is reaching maturity – our Multidimensional perception is getting stronger, clearer, more direct. It certainly is lovely to be so aware, so in love with the process, so in love with all that is. – My inbox and sent messages were wiped clean by a tech glitch this week. If you sent me an email or requested a private session in the last week, write me again! – I will have the video camera situation fixed soon, so videos will be available. – I arrive in Sedona today, still unsure where I will be staying. Write me if you have housing referrals for now – end of May. – If you want to join me in opening gateways in Sedona, please set up a gathering and write me.